It’s 2010 in Cortez, Colorado. Sue (Amanda Stephens Lee) and her family are feeling their way through a new reality caused by the global financial crisis. Their entire working class town is suffering, and Sue lost her main street beauty shop; she now operates out of her basement, with minimal resources and one fellow employee – her friend Meg (Charmaine Bingwa). With the money they’ve saved by quitting smoking, Sue and Meg are hoping to patent a new hair treatment and get out of the basement – maybe then they can win some customers back from the Supercuts inside the new Walmart. The megastore seems to have swallowed the town whole, all personality disappearing under long aisles of discount goods. Everyone in Cortez is searching for a way up and out. Faced with financial uncertainty and no hope of government assistance, Helen (Jill Mackay) plays the lottery. Sue’s sister Doll (Janine Watson), a grieving alcoholic, is trapped in one of regional America’s ubiquitous MLM schemes. And then there’s Sue’s daughter, Judy (Caitlin Burley): she has a photographic memory and has been accepted to Colorado State to study music, but Sue is determined that she should instead pursue chemical engineering at MIT. If she receives a full-ride scholarship, then Judy – and Sue, in some small way – will have an all-expenses-paid escape from the underclass. One small problem: Judy might be pregnant. Should she take on a hard-working life of struggle so she can experience motherhood? Sue and Doll say it’s the best thing they’ve ever done; maybe it could be better for Judy than the white-collar landscape of MIT? After all, the rich girls in town treat Judy with pity; is she in for a lifetime of that if she tries to climb the class ladder? 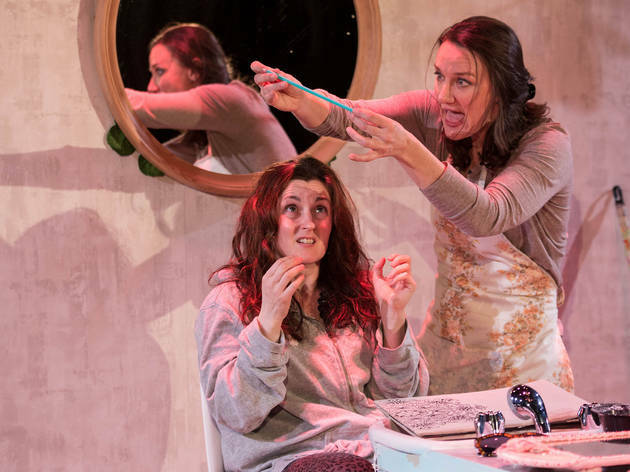 American Beauty Shop, by self-described “blue collar female playwright” Dana Lynn Formby, is a close look at the working poor and the cyclical nature of the social poverty. It touches on so many issues – apart from class: rural race relations, abortion rights and Big Business – that it meaningfully connects with only a few. Programming at Kings X Theatre is diverse and ambitious; as an unfunded theatre company in a tiny traverse space within a pub, the fact that it presents challenging, diverse, socially conscious and political theatre is remarkable. But not every production can be a winner under these circumstances. Formby’s play tracks every last injustice these women face, but it has almost no time left for a plot. The one it does have is hackneyed (when Sue’s precious savings are shown in their hiding space, it feels like only a matter time before they go missing) and unsubtle. 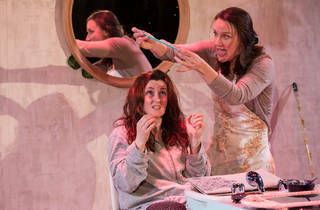 A play this heavy-handed needs to be directed with a strong focus on emotional nuance, but Anna McGrath’s production feels under-rehearsed: actors frequently stumble over lines and self-consciously over-correct; American accents hang awkwardly off hard emphases at the end of a word, or disappear completely. When you’re in a naturalistic setting, these details break the spell; it’s hard to get an audience on board when they’re presented with an inconsistent reality – the high stakes are lowered every time you remember you’re watching a play. There’s an interesting alchemy between the cast that isn’t quite working yet, but may well settle further into the run: there’s an edge of danger to Sue and Doll’s uneasy closeness; Watson in particular brings a welcome consistency and depth to her performance. Perhaps as the season continues, this production will get a little sharper, tighter, and more rewarding for audiences.